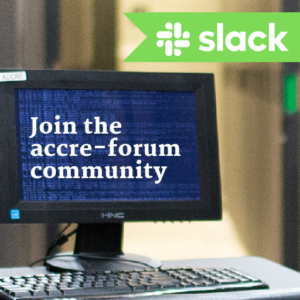 The first time you start ACCRE, you may see a message asking if you trust the system you are attempting to log in to. Type “yes” and hit return. The next time you start PuTTY, you just need to double click on ACCRE in the Saved Sessions section and it will load automatically. Click Open to start the terminal connection. As with the Mac/Linux login, you may see a message asking if you trust the system you are attempting to log in to. Type “yes” and hit return. Your username, if prompted, is your VUNetID. Type it in and press enter. Your password is in an email you should have received from ACCRE. The password system for ACCRE is separate from other Vanderbilt sites (the “ePassword”). Enter your password and hit return. Note that for security reasons the password will not appear as you are typing. Your ACCRE password must be at least 14 characters long, and not more than 4096. Your password must receive a perfect score on the ZXCVBN test. In addition to uppercase letters, lowercase letters, numbers and symbols, you may use non-ASCII characters (including emoji, Chinese, Japanese, or Korean). However, you may have difficulty logging in later with different keyboards or terminal utilities. All characters must be printable and in UTF-8. If you need a password that can pass the ZXCVBN test, type in accre_password generate. Your password change will be propagated out to all of the nodes within approximately 20 minutes. Your terminal is now set up and ready to use. As a reminder, you will need to register for training within the first two months of receiving your account. SCP clients are useful for transferring files to and from the ACCRE server. If you prefer a graphical interface, we recommend FileZilla. For Windows users, you can use PSCP, which comes with the most recent installations of PuTTY. Open the command prompt (on Windows 10, right click the Start menu and choose “Command Prompt”). Then use the same command above, replacing “scp” with “pscp”. Windows users can also use FileZilla or WinSCP, an SCP client with a graphical user interface. Click here, then use the Installation Package link to begin the download. 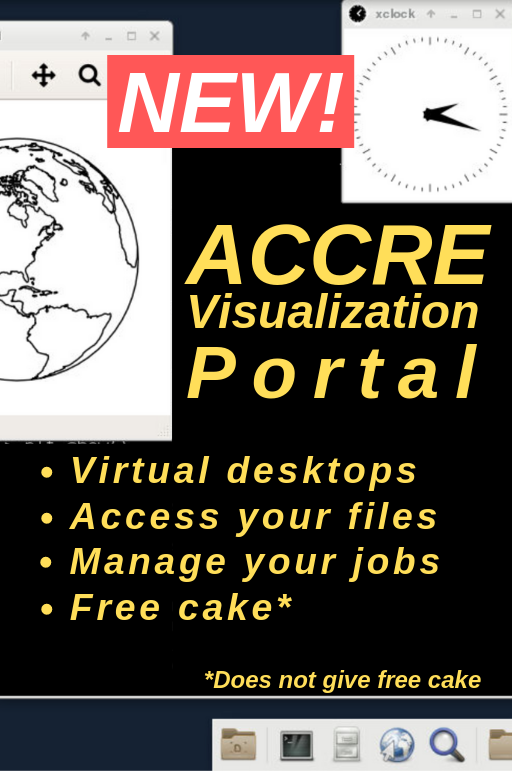 The X Window Server lets you run applications on ACCRE that have a graphical user interface. While it may come in useful at times, applications running on an X connection are slower than if they are running locally. For this reason we do not recommend using it (especially from outside campus) unless there are no alternatives. For Windows systems, download and install Xming. Then load PuTTY, load the ACCRE shared session, then expand the SSH item and go to the X11 page. Click the checkbox to enable X forwarding, then set the X display location to “localhost:0” (without the quotes). Then go back to the Session page and click on Save. 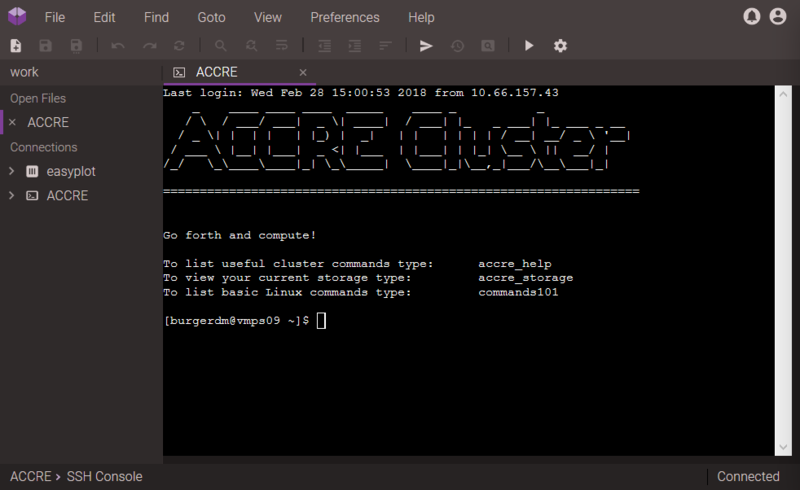 Any future connections using the ACCRE shared session will use the X Window Server installed. To make sure everything is working properly, type in “xeyes”. A window should open of a pair of eyes that move around with your cursor. 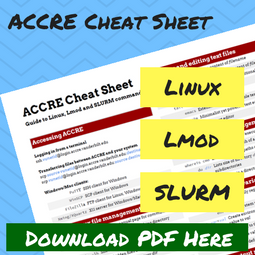 Even though it appears similar to a program on your computer, it is being run on the ACCRE gateway. Some X11 applications require “trusted X11 forwarding”, which can be enabled by replacing -X with -Y. Use the -Y flag only if necessary, since it is less secure than -X. If you wish to view your default environmental settings, type set. Your “shell” is essentially your working environment while you are logged onto the cluster. Virtually any of the newer shells add such functionality as command/filename completion (e.g., spell part of the command, hit a “hot key,” and the shell will try to complete the name of the command/file), command line editor (so you can edit and re-invoke previously executed commands), manipulation of history on the system, and definition of command aliases/functions. Currently the default user shell is set as bash. Commands issued now (e.g., the passwd command) will effect modifications to all of the nodes. You will be prompted for your choice of shells. Enter/bin/bash for the bash shell or/bin/tcsh for C-shell. To disconnect from auth, type exit. You will still be logged into your account. You may either continue working on the cluster or log out. Your shell change will be propagated out to all of the nodes within approximately one hour.